Place the egg whites and lemon juice in the bottom of a medium mixing bowl or stand mixer. (Make sure there is no grease residue on either the bowl or the mixer… or things will get weird. And by “weird,” I don’t mean “good.”) Beat on high speed for 3-5 minutes or until the egg whites are thick and foamy and will hold their shape if you were to make a stiff peak or, you know, sculpt an egg white replica of the Taj Mahal. Reduce mixing speed to low and slowly pour in the sugar. Mix for an additional minute on medium speed and then add your peppermint oil. I try to add only one drop, but it always ends up being two. Mix again for 30 seconds. Put one of those big ol’ Wilton 2D star tips inside a pastry bag or a ziplock bag with the corner cut off. Using a pastry brush or a folded up paper towel, paint the sides of the bag with red food coloring. 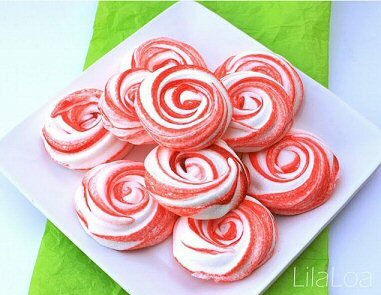 Stand the bag up inside a drinking glass and fill with your peppermint meringue. Place some parchment paper on a cooking sheet and pipe 2″ circles all over the place. I like to start in the middle and then go around and then do another circle on top, but you can pretty much do whatever you want. Try to leave about an inch between each meringue circle. Bake for 2 hours. Eat as many as you can possible stand. And then make more for everyone else. Place the egg whites and lemon juice in the bottom of a medium mixing bowl or stand mixer. (Make sure there is no grease residue on either the bowl or the mixer… or things will get weird. And by “weird,” I don’t mean “good.”) Beat on high speed for 3-5 minutes or until the egg whites are thick and foamy and will hold their shape if you were to make a stiff peak or, you know, sculpt an egg white replica of the Taj Mahal. Reduce mixing speed to low and slowly pour in the sugar. Mix for an additional minute on medium speed and then add your peppermint oil. I try to add only one drop, but it always ends up being two. Mix again for 30 seconds. Place some parchment paper on a cooking sheet and pipe 2″ circles all over the place. I like to start in the middle and then go around and then do another circle on top, but you can pretty much do whatever you want. Try to leave about an inch between each meringue circle. Bake for 2 hours. Tagged Baking, Christmas, printable coupons, Recipes. Bookmark the permalink.